Last Saturday, my friend and I had one of those late night conversations about life. I don’t know how we got on the subject, but I proceeded to tell her everything I learned through my suffering. I told her what I gained through my experience of getting to the other side of joy. The next morning, a guest pastor delivered a message I needed to hear. From the moment I heard the title, “Making Sense of Suffering,” my friend and I knew this message was intended for us. The pastor began to preach and every single point he hit was my whole process of getting to joy. I thought of everything I’ve gone through and all of the work I’ve done to get to this point. I thought of the time I said yes to God…READ MORE. I’m back with Part 3 of my story. I know it’s been a long time, so if you need to refresh your memory, read Part 2 here! “Jen, my ankle,” Mom said. I tried to ignore her. Mom complaining about her ankle is just her way of trying to quit the race. I’m not having it. We’re at the halfway point, I think. But I am slightly concerned we maybe overdoing it at this point. We reach another obstacle. There is a dip in the middle of the road filled with muddy water that we have to cross. I could hear the moans and screams from many of the participants in front of us. Not one person could get out of this muddy pit. I quickly strategize to see how Mom and I can come out of this alive and with her ankle intact. Meanwhile, Mom is still reeling from that fire truck and her ankle, her poor ankle. She says she can no longer lift herself up, and I can see the paralyzing fear on her face. In trying to keep the situation calm, I quickly grab her hand and just go for it. She, of course, released my hand, which left me no choice but to move forward. Someone has to lead, right? I, once again, dive head first into the mud. Mom follows me and forgets that she ever injured her ankle. After we pull ourselves up out the mud for the 1000th time, we head into the woods. “What’s that?” I ask Mom. I can see a weird yellow apparatus ahead of us. As we move closer and closer, my biggest fear started to come true. “That thing is huge!” I tell Mom. She doesn’t answer, but just stands with me in the woods silent. We both look up as if we were facing a giant. This net had to be about 15 feet in the air. “I’m not doing this,” I said. “Come on Jen!” Mom replied. She approached and started to climb the net. I was still hesitant. That thing is just too high. Now I’m the one who needs a cheerleader. I am deathly afraid of heights. Because Mom did it, I decide to take those first steps on this net/apparatus thing. It didn’t seem bad at first. Mom quickly made her way to the top, so I began to climb faster. I soon realized this thing is highly unstable. I began to sway from side to side as more people started to climb. I even see kids pass me, make their way to the top and climb over. This whole situation is just sad. And to add insult to injury, Mom decided it was just too much for her to finish the obstacle. She then proceeds to climb down. So there I was on the net, frozen. Did I mention I’m deathly afraid of heights? It seemed like I was stuck there forever. I’m pretty sure over 100 people passed me at this point. After a few minutes of strangers coaching me through, I finally climbed over and down the obstacle. Mom was just happy to get a break. She had a conversation with one of the mud run volunteers. After climbing down, I saw another person trying to conquer the same fear. I didn’t have the heart to help her. Mom and I had to move on. We lost a great deal of time. We power walked into the woods hopefully for the very last time. 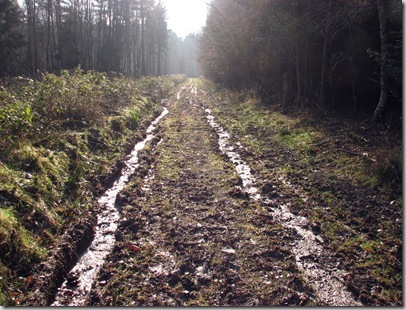 As we ventured further, it seemed the mud was getting deeper and deeper. And there was no end in sight. I had to rely on my wits and my faith in God to get me through the rest of this race. After quite a few falls in the mud, Mom almost quit again. She then fell again. I’m over this whole cheerleader thing. I’m hot, sweaty and dirty. Her survival skills are just going to have to kick in. Sorry Mom. After five more obstacles, we could finally see the end! We could finally see sunlight! And our whole team waiting for us! But we weren’t at the finish line…yet. Mom instantly thought the race was over. Her boss, co-workers and I had to convince her to finish. So we dragged her up that last hill and carried her over the finish line. We did it. We finished in just under 3 hours. And we weren’t last. There were at least three people behind us. On the other side of the woods we run into three big lakes. No problem! We can swim. We just walked through the first one. The second one had ropes on each side. As we continued to walk, we realize the lake was 6 feet deep! Wait, what? That explains why I can’t feel the ground. This part was not in the informational video. We quickly swim through with the help of the rope. “I think I quit,” mom said. I guess this is the coaching part, but my competitive spirit took over. Maybe it was the thought that she dragged me to the gym almost every day to train or that she even talked me into doing this race in the first place. Plus the $60 entrance fee. Besides, I think I just swallowed a gallon of muddy water. It looks like she got more than what she bargained for, because from the expression on her face she didn’t know which was worse, her daughter yelling in front of more than a 1,000 people or the fact that I just talked to her like she was some girl out in the street. But desperate times call for desperate measures. I could tell she took what I said into serious consideration, because she swam through the other lake with no problem. The only thing I heard her say was, “Use the rope and keep your chin up.” She was done after that. But the hills were next. We climbed about 5 hills before we reached the water slide. We both looked down from the top of the hill as more people slid down. “This is supposed to be the fun part, right?” I asked. “There is a water station just up ahead,” a runner said. Praise Jesus. We finally approach mile marker one, then two. Mom is still power walking as more people run past us. “Are you ever going to run?” I asked. “You did not convince me to run 3 miles every other day to just walk.” Mom never responds. Instead she walks just a little bit slower and a few more people dash in front of us. I noticed everyone’s numbers. We’re team 408. There are more runners with team numbers in the 700’s. Our wave is far ahead of us. As for the rest of our teammates, they were ahead of us in the beginning. I decide to take a stand. My competitive spirit comes back. Maybe it’s in the air. “We’re not going to finish last.” I said. “I don’t care what we have to do, but we are not going to finish last.” Mom forgot there were timing chips in our numbers. We finally get to an opened field when I see water. Not just a drop of water, but a lot of it. This water is not a mirage, I told myself. And you know what? I don’t care if the water is a mirage. I’m dirty, sweaty, and hot. I need some relief. But I would be concerned if I ran towards it and I would slip and fall into a pile of mud if it was a mirage. That’s all I need at this point. But it’s not a mirage. The fire department thought it would be a good idea to hose us down in the middle of the race. They are pointing water hoses towards us. Not one, but three. “Look, Mom!” I said. “There’s water!” She never responded. I think she zoned herself out, thinking of better days. We haul our butts as fast as we could through the water. As soon as we finished running, she screamed “My ankle!” At this point, I’m not hearing it. One part of me is probably in denial that she actually sprained her ankle and the other part of me is thinking we’re in the middle of nowhere. Who is going to come and rescue us? I don’t have my phone. On the other hand, this was her plan the whole time. Fake an injury and get out while she can. Not on my watch. This picture describes my journey to health. It has not always been easy, but the sun is always shining. Courtesy of BredeHighWoods.blogspot.com. “What number is our wave?” I asked as we made our way to the starting line. I’m nervous about this race and I haven’t been feeling well since I came down with a bad case of allergies. 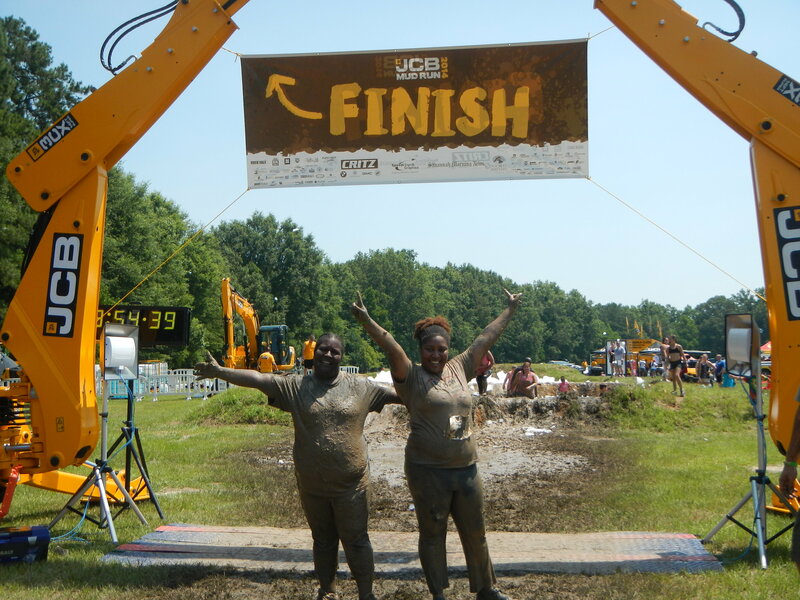 We’re in the middle of nowhere for the third annual JCB Mud Run. Their signs and dump trucks are everywhere. Wait, why do they need dump trucks? I look around and see more muddy hills than I cared to see and a foam pit, which actually looks like fun. But it’s the summer in South Georgia. I don’t know if I can take this heat. I asked myself, “Why did I agree to do this?” Oh wait, because mom convinced me, and it’s not like you can say no to your mother. Or at least I can’t. Here’s the back story: Almost a year ago, mom joined a lean challenge at work. She and the “team” thought it would be a good idea to start training for races. Soon after, she started telling people I somehow helped her become a healthier person. Hence, the reason I’m at the starting line too. Since I’m in better shape, I’m supposed to be a coach of some sort, to help her through the obstacles. I would be considered a hater if I didn’t agree to participate in this race, and I would probably feel bad about it. It would also give my family free rein to talk about me until the day Jesus comes back. My guilty conscience wouldn’t let me sit on the sidelines. Her teammates were happy we made this a mother-daughter event. Truthfully, I’d rather attend Zumba and have a smoothie afterwards. Picture this; a bunch of overzealous adults in their late 40’s and early 50’s, and then there’s me – the millennial. The optimistic side of me was excited to conquer something new. Besides, it’s not everyday that you get to play in the mud. Our wave is next. The hosts count backwards from ten and we’re off. Everyone including mom takes off running. We were going at a steady pace…at first. As I looked back, we realize we were the last team in our wave. Note to self: Never look back. We get to our first mud pit. I tried to take my time and tip my way in. That strategy didn’t work. I trip and go in feet first. As I make my way out, my mother dives in. I try to pull myself out and immediately I slip back in. We finally climb out of the pit together. I start to run towards the woods. Wait…why we are running towards the woods!?!?!? I guess today I’m going to have to be one with nature. As I looked towards my left and my right I noticed mom wasn’t beside me. She fell behind. Don’t look back, I told myself. She’ll catch up. But no, I don’t listen to my own advice. I decide to wait for her. But she’s not running, she’s walking. I mean power walking; you know, to keep her heart rate up. While she catches up with me, a group of about 100 more people come running into the pit. We get some motivation to run as fast as we could in the woods, but most of them ran past us. #Fail. “Why did it take us so long to get to the woods,” I asked. I never got an answer. My mom was already out of breath. This can’t be good. My birthday is less than a month away. Some people call this one a milestone. I always pictured what my life would be at this age. I’m sure we all did, but our plans never happen the way we want. When I think about this year in particular, it makes every plan that I had not coming to fruition the biggest blessing I ever received. This year is certainly time for reflection. When Sarah Williams from Adventures of a School Teacher penned a blog post expressing gratitude in her life, I had to accept the challenge. Here are my first 5 reasons. I’m a firm believer that when you live a life filled with gratitude, you increase space for more good things to happen to you. My life. I wouldn’t trade my life for the world. Every day I start a prayer thanking God for waking me up, and giving me the gift of life. I understand there are a reason and a purpose why I was chosen to be here on earth and sometimes I fail at working towards that purpose. But God still chooses to wake me up every day to give it another shot. Adversity. I know you’re probably wondering why am I thankful for the bad things that happen to me? Many people associate adversity as being something negative. But adversity is inevitable. With so much that I’ve been through, I had no choice but to embrace it. Adversity became my friend. The truth is when we go through adversity it pushes us to initiate real change. I’m convinced that growth is painful, and we might fall more times than we’re able to stand, but that’s when we begin to see the greatness that is within us and for that I’m grateful. My support system. I’ve heard the saying there are people who come into your life for a reason and a season, and that saying never fully resonated with me until a support system started to form around me. Let me tell you, some of these people were the very least I thought would provide any type of support. When life would kick me at every way possible, my “inner circle” of friends, family and mentors became a hub of constant prayer and encouragement. I know I can call them for just about anything. And they allow me to do the same for them. Now that I have strong support system, it is so much easier to let go of people who just simply are not there for the long haul. But that doesn’t mean I’m not thankful for the lessons I learned along the way. My gifts. It took me a very long time to accept what I’m naturally good at as gifts. I used to believe in the cliché that you can do anything you put your mind to. While that may be true in some instances, you can’t achieve real fulfillment until you have used your gifts to carry out your purpose in some way. Naturally, I’m a storyteller. When I was growing up, and I discovered something that no one else knew, and it wasn’t a secret, I couldn’t wait to let everyone know. Every year someone would give me a journal. I mean, like every year. And every year it would be a different person. It seemed like when I would get a journal, it was another dose of confirmation telling me writing in some form is what I should be doing. Even back then people were giving me a piece of my dream. Coincidence or not? My circumstances. No matter how much I work I put into moving forward, I am also grateful for the time I’m spending in my current season. Plus, I’m trying this whole being content where I am thing, but I digress…But seriously, I know there is a very specific reason for the place I’m in now. Because sometimes you are put in places to be developed, to be molded and shaped into who you are meant to become or to prepare you for something better. I never want to be put in a position or go into another phase unprepared. I at least try to live in the present instead of always thinking ahead. No matter how much you plan, you never know what the outcome is going to be. I love it when a sequel is done right! With the TV promos, radio interviews and press junkets in heavy rotation, it wasn’t a surprise when I rushed out of the office early and went straight to the movies to buy advance tickets of Think Like A Man Too. The promotion for this movie was on point. I even splurged on a later showing for my mother and I. She’s a fan of the movie too. 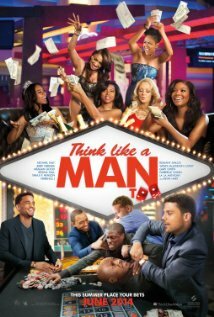 When the first movie, Think Like A Man was released back in 2012, the concept was centered on Steve Harvey’s New York Times Bestseller, Act Like A Lady, Think Like A Man. So when the sequel was released today, I thought maybe Harvey’s second book would be the concept, but as I began to see previews for the movie, I walked in the theater with no expectations. What I received was even better. The winning combination of director Tim Story and power producer Will Packer does not disappoint. There was no complex storyline. The movie was just simply funny. Everything picked up where it left off as the cast reprised their roles like no time has passed. The whole cast is back for part two of an incredible ride of laughter and fun even leaving room for some new faces. The chemistry comes alive once again, which only makes perfect sense why the sequel would take place in Sin City. The plot of the movie is reminiscent of a cross between The Hangover and The Best Man, except no one is keeping a deep dark secret and everyone remembers what happened the night before. But one aspect does hold true. Michael (Terrence Jenkins) and Candace (Regina Hall) are getting married, so we all know what that means – the gang is back together again! While the excessive alcohol, naked strippers, and the inevitable drama of the bachelor and bachelorette parties prove to be run-of-the-mill, it also provided a bit of nostalgia. For me, I wondered what my bachelorette party would be in 5 or 10 years. The men and women were easily divided as one group tried to out do the other. Which group can throw the most epic party? The character’s personalities shine through even when their roles were clearly defined in the first movie. There was the over-zealous friend much like Cedric (Kevin Hart). He overspent on hotel accommodations (See, the way my bank account is set up…) to ensure his friends had the best time. There were memorable scenes, like the girls accidentally getting high when Kristen (Gabrielle Union) gives all her girls pot breath strips given by her now husband Jeremy (Jerry Ferrara). We also get to finally meet Tish (Wendi McClendon –Covey) who is Bennett’s (Gary Owen) wife transform into a bombshell when the girls perform Bel Biv DeVoe’s hit Poison. All of these moments are components for a true instant comedy. Think Like A Man Too has one central theme in which everyone can relate – the ability to move forward. We see that when Michael and Candace finally stands up to his overbearing mother, when Maya (Megan Good) forces Zeke (Romany Malco) to let go of his past, and finally when Lauren (Taraji P. Henson) and Dominic (Michael Ealy) make sacrifices in their careers for the sake of their relationship. Cameos from Drake, George Wallace, Coco, and Wendy Williams only adds to the repertoire of an excellent plot, great cast and awesome scenes. Plus, many more surprises along the way. Think Like A Man Too is no-holds barred, in your face romantic comedy that will be talked about for many summers to come. As soon as the ending credits were over, my mom looked at me and said, “Excellent.” I agree. She’s a harsh critic too. What do think? Have you seen the movie? If not, Think Like A Man Too is theaters now. Last week, I caught up with an old friend I haven’t talked to in a while. Each time we talk, the conversation always turns to my health. But this time was slightly different. After I briefly told him how I was doing as far as my health is concerned, he came back with an interesting follow up question. It seems like I get asked that particular question all of the time. My knee-jerk reaction was to say, “Of course,” and that’s exactly what I did. But I never took the time to think about if I was really happy, until two weeks ago. Mother’s Day weekend last year marked a pivotal moment in my very short life – my health scare. A few months before, I started taking hormone therapy as a solution to treat my uterine fibroids and ovarian cysts. It was even used as a diagnostic tool for suspected endometriosis which I address in my previous blog post: Joy Comes in the Morning: My Battle with Fibroids, Ovarian Cysts and Endometriosis. I thought hormone therapy would be easy in comparison to the emergency room visits, biopsies and a ruptured cyst. In the beginning, I had a few side effects which included hot flashes, night sweats, memory loss and headaches, but within a week, the side effects became progressively worse. The headaches turned into debilitating migraines and the pain was so magnificent, it’s literally indescribable. It was not until my mom found me in my room unresponsive is when we learned the side effects from the hormone therapy started to affect my brain function. I underwent a spinal tap procedure. Soon after, I began to leak spinal fluid. I soon lost my vision; my balance and I developed a spinal headache, which surpassed the pain of any migraine in the world. All I remember is my mother rushing me to the hospital and everything went black. I thought about that question my friend asked as I replayed that weekend over and over again in my head. It became hard for me to accept what happened, especially when there was no solution in sight. I was literally healthy at one point and all of a sudden life changed for me in a second. I could accept if my situation was preventable or if it was something I did, because that meant I could have some level of control. But God quickly showed me the true meaning of trust. The one thing I do know is my health scare changed me for the better. There is unspeakable joy I get when I think about how I felt when I thought joy was unattainable. I felt like Oprah having one of her infamous full circle moments. From the furniture arrangements to the blankets I slept with on the floor, everything remained the same when I had my health scare last year. And it just so happened to be Mother’s Day weekend. Time was repeating itself. The only thing noticeably different was me. Then I realized somehow I was granted a second chance. God took me to the end of the earth and brought me back wiser and stronger than ever. Without even noticing, I developed a new zest for life. A certain part of me died during my health scare and now there is something in me being reborn. I went from traveling through a tunnel that kept getting darker and darker not knowing if the end was near. The further I traveled, the more alone I became, and when no one could find a solution, I saw God walking with me. There is truly a blessing within the blows of adversity. It’s an opportunity to show what you’re truly made of. It’s an opportunity to pull yourself up by your boot straps and conquer the fear of starting over. It’s really a wonder to feel like my old self again, but I know I will never be the same. What about you? What types of adversity did you overcome? Did it change you for the better? Was it a blessing? Click on the post and comment below! Be candid in your response! Candid Commentary by Jennifer Branison is licensed under a Creative Commons Attribution 4.0 International License.